It’s finally here: the opening day of NERGC — the 2015 New England Regional Genealogical Consortium — at the Rhode Island Convention Center in Providence. People from all over New England — people with roots back in New England — people who are just interested in New England genealogy are starting out today with the Librarians and Teachers Day Track and the Tech Day track. And then the whole conference gets underway tomorrow. While explains why The Legal Genealogist has been up to her eyeballs recently in early New England law. Monday, we looked at some Rhode Island resources.1 Yesterday, it was a cool little volume of the earliest Massachusetts laws.2 Today, it’s Connecticut’s turn — and oh my… there are some gems out there. First and foremost, a general resource for anybody who’s even thinking about researching in Connecticut. It’s a website called ConnecticutHistory.org and it’s a wonder all by itself. Described as “a project of Connecticut Humanities and your home for stories about the people, traditions, innovations, and events that make up the rich history of the Nutmeg State,” it has sections on the towns, topics and people of Connecticut. Among the roughly 40 topics covered by the website will surely be one that is just what you’re looking for — there are topic categories for disasters, education, folklore — and there surely are some that were just what I was looking for — crime and punishment, law, politics and government, even slavery and abolition. And the law page in particular is worth a visit, because it brings together some links that are surely worth any researcher’s time. • “Connecticut Resolutions on the Stamp Act: December 10, 1765.” Avalon Project, Yale Law School. • “The Public Records of the Colony of Connecticut, 1636-1776.” University of Connecticut. • “Constitution of the State of Connecticut.” Connecticut State Library. • “Litchfield Ledger.” Litchfield Historical Society. • “Charter of Connecticut – 1662.” Avalon Project, Yale Law School. • “Fundamental Agreement, or Original Constitution of the Colony of New Haven, June 4, 1639.” Avalon Project, Yale Law School. • “Wethersfield Prison Records.” Connecticut State Library. And if you keep scrolling down on the law page, it’ll take you to digitizations of some of Connecticut’s earliest laws, including Elisha Babcock’s 1786 Acts and Laws of the State of Connecticut, in America and Zephaniah Swift’s 1795 A System of the Laws of the State of Connecticut: In Six Books. Another great resource is the Connecticut Legal History collection of eYLS: the electronic collections of Yale Law School. There you can read, for example, William Lanson’s book of satisfaction — a 12-page pamphlet from 1848 — in which he “disclaims responsibility for murder of C. Parkisson by Samuel C. Yemmans in his boarding house; denies that his is a disorderly house.” Or you can review Aholiab Johnson’s account ledgers for his law practice in Stafford and Somers from 1825-1840. Or Sanford Billings’ Justice of the Peace records, c1795-1797, in Stonington. Both online and offline, the Connecticut State Library in Hartford is an amazing resource for anyone doing research in the Nutmeg State. 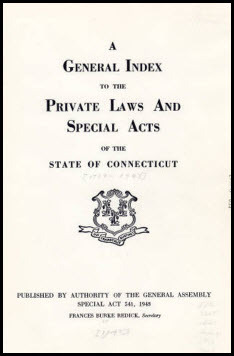 In particular, printed copies of all of Connecticut’s Public and Special Acts and General Statutes are available at the library, and it offers downloadable indexes to some of the most genealogically-valuable laws: the private laws and special acts. You can download a PDF index to the private laws of 1789-1943 and another for the special acts of 1944-2008. And for modern Connecticut legal resources, look no farther than the Connecticut Legal Resources page of the Connecticut Judicial Branch Law Libraries — it has links to today’s statutes, all of Connecticut’s constitutions and more. Just wanted to thank you for all the sources you share with us. I’m keeping them in email folders under the proper state for when I have time to dig in and research, and these CT sources will be great for my many early CT families. Also wanted to share a fab resource with you for when you write about New York. The “Hudson-Mohawk Genealogical and Family Memoirs: Index to Families” for the counties of Albany, Columbia, Fulton, Greene, Montgomery, Rensselaer, Saratoga, Schenectady, Schoharie, Warren, Washington has biographical info on some families that is very helpful/interesting. It’s part of the Schenectady Digital History Archive, which has a lot of great info for people with roots in that part of New York. Bless you for the pdf, Judy. All those friendly links are going to make my life easier (and a lot busier). Very juicy. Enjoy your time at the conference. Dang, I wish I could be there- what an opportunity. But next time, I hope. Attended one of your sessions today at NERGC. In a word, “OUTSTANDING”! Thanks for the kind words about eYLS. We have an extensive collection in print as well, for those who can visit.